Italian niche line Bois 1920 will launch Nagud, a new fragrance. An intense and memorable writing. The citrus tonalities, Essence of Lemon and Bergamot, open this unique and unforgettable composition with mysterious and warm Saffron shades. The heart is a sophisticated floral bouquet, spotted by precious Turkish Rose Essence-Absolute, Geranium and Ylang Ylang Essences, intertwined in a soft and sensual embrace with Myrrh Essence. The drydown closes on eclectic Essences of Sandalwood, Guaiacwood, Patchouly, Styrax, Incense, Nagarmotha and wonderful Vanilla Absolute. 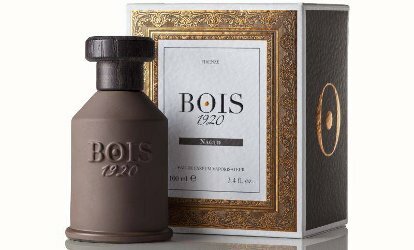 Bois 1920 Nagud will be available in 100 ml Eau de Parfum. With that name i was expecting oud to be listed among the notes. Well, it’s partly listed if you count the nargamotha, which usually plays its role. I figured “nagud” probably meant something, but I don’t know what. You misunderstood me, i didn’t imply the name seems to be an oud name, but the exotic name certainly makes you expect the exotic wood du jour, which is half there if you consider the nargamotha. Gotcha. I still though nagud must mean something though! Seems an odd word to make up. Looks like the bottle is made of chocolate! Yummm.